نوروزی, مهرنوش, باقری توانی, مصطفی. (1397). شناسایی ترکیبات پروفیل اسیدآمینه ماهی کفال طلایی (Liza aurata) دریای خزر. فصلنامه محیط زیست جانوری, 10(3), 159-166. مهرنوش نوروزی; مصطفی باقری توانی. "شناسایی ترکیبات پروفیل اسیدآمینه ماهی کفال طلایی (Liza aurata) دریای خزر". 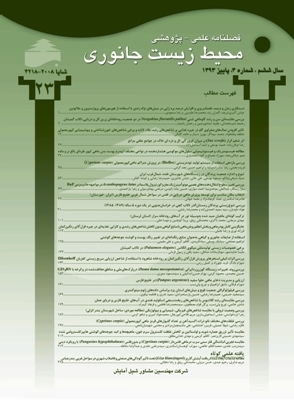 فصلنامه محیط زیست جانوری, 10, 3, 1397, 159-166. نوروزی, مهرنوش, باقری توانی, مصطفی. (1397). 'شناسایی ترکیبات پروفیل اسیدآمینه ماهی کفال طلایی (Liza aurata) دریای خزر', فصلنامه محیط زیست جانوری, 10(3), pp. 159-166. نوروزی, مهرنوش, باقری توانی, مصطفی. شناسایی ترکیبات پروفیل اسیدآمینه ماهی کفال طلایی (Liza aurata) دریای خزر. فصلنامه محیط زیست جانوری, 1397; 10(3): 159-166. هدف این مطالعه،بررسی و شناسایی ترکیب پروفیل اسیدهای آمینه در جنس نر و ماده ماهی کفال طلایی (Liza aurata) در دو دوره­ تولیدمثل و غیرتولیدمثل بود. به­همین منظور تعداد 100 قطعه ماهی کفال طلایی از صید پره، در دو فصل بهار (غیرتولیدمثل) و پاییز (تولیدمثل) در سواحل جنوبی دریای خزر جمع آوری گردید. پس از زیست‌سنجی نمونه­ها، اندازه­گیری پروتئین با روش­ استاندارد کجلدال و آنالیز اسیدآمینه به­وسیله دستگاه HPLC انجام شد. نتایج نشان داد که ماهیان نر، میزان پروتئین بیش­تری نسبت به ماهیان ماده داشتند. هم­چنین ماهیان در دوره­ غیرتولیدمثل دارای پروتئین بیش­تری نسبت به ماهیان در دوره­ تولیدمثل بودند (0/05>p). از بین مجموع اسیدهای آمینه ضروری و غیرضروری در ماهیان نر و ماده، اختلاف معنی­داری مشاهده نگردید (0/05<p)، بنابراین جنسیت تاثیری در محتوای اسیدهای آمینه ندارد. لیزین بیش­ترین مقدار را در مجموع اسیدهای آمینه ضروری و اسیدگلوتامیک بیش­ترین مقدار را در مجموع اسیدهای آمینه غیرضروری در هر دو جنس و در هر دو دوره تولیدمثلی به­خود اختصاص داد. بین مجموع اسیدهای آمینه ضروری و غیرضروری و کارایی پروتئین در دو دوره­ تولیدمثلی اختلاف معنی­داری مشاهده گردید (0/05>p). نسبت TEAA/TNEAA ماهیان در دوره تولیدمثل 0/99 و در دوره غیرتولیدمثل 1، محاسبه شد. هم­چنین نسبت لوسین/ ایزولوسین در ماهی کفال طلایی از نسبت خوبی برخوردار بود. بنابراین ماهی کفال طلایی غنی از مهم­ترین اسیدهای آمینه موجود در آبزیان دریایی ا­ست و گوشت آن از کیفیت بالایی برخوردار می­باشد. جنت­علیپور،ح.؛شعبانپور، ب.؛صادقی­ماهونک، ع. و شعبانی، ع.،1388. بررسی ارزش تغذیه­ای فیله­های خام و کباب شده تاس­ماهی ایرانی (Acipenser persicus). مجله علوم تغذیه و صنایع غذایی ایران. سال 6، شماره 3، صفحات 85 تا 94. سرحدی، ن.؛ معتمدزادگان، ع.؛ طاهری، ع. و آزاد، م.، 1391. بررسی مقایسه­ای ترکیبات مغذی و پروفیل اسیدهای آمینه در استخوان­های ماهی ساردین پهلو طلایی (Sardinella gibossa)، کیلکای آنچوی (Clupeonella engrauliformis) و موتو ماهی (Stolephorus indicus). مجله علمی شیلات ایران. سال 21، شماره 1، صفحات 101 تا 112. شریفیان، م.، 1393. بررسی ترکیبات بدن ماهی بنی (Barbus sharpeyi) در محدوده گروه­های طولی مختلف درمنابع آبی استان خوزستان. نشریه توسعه آبزی­پروری. سال 8، شماره 3، صفحات 65 تا 76. ذاکری، م.؛ کوچنین، پ. و جاسم­غفله، م.، 1391. مقایسه ترکیب اسیدهای آمینه در بافت ماهیچه ماهیان وحشی و پرورشی نر و ماده شانک زرد باله (Acanthopagrus latus).مجله علوم و فنون دریایی. دوره 11، شماره 2، صفحات 58 تا 66. نوروزی، م. وباقری­توانی، م.، 1395. تعیین ترکیبات بیوشیمیایی و ارتباط آن با برخی شاخص­های زیستی و فیزیولوژی ماهی کفال طلایی (Liza aurata) در دریای خزر. زیست­شناسی دریا. سال 8، شماره 31، صفحات 45 تا 60. هادیزاده، ز.؛ مورکی، ن. و معینی، س.، 1392. شناسایی ترکیب اسیدهای آمینه و اسیدهای چرب در گوشت ماهی سارم دهان بزرگ (Scomberoides commersonnianus) در خلیج فارس. مجله زیست شناسی دریا، سال 5، شماره 17، صفحات 35 تا 50. Abdollahi, S.A. and Abolude, D.S., 2002. Investigation of protein quality of some fresh water fish species of Northern Nigeria. Academy Journal of Science and Technology. Vol. 2, No. 1, pp: 18-25. Ackman, R.G., 1995. Composition and Nutritive Value of Fish and Shellfish Lipids, In: Fish and Fishery Products. In: Ruiter, A. (Eds. ), CAB International Publish. pp: 117-159. Ali, M.; Salam, A.; Goher, S.; Tassaduque, K. and Latif, M., 2004. Studies on fillet composition of fresh water farmed (Labeo rohita) in relation to body size. J. Biol. Scie. Vol. 4, pp: 40-46. AOAC (Association of Official Analytic Chemists). 2005. Official Methods of Analysis AOAC, Washington DC, 1963 p.
AOAC (Association of Official Analytic Chemists). 1990. Official methods of analyses of association of analytical chemist (15th ed). Washington, DC: AOAC. Belavady, B. and Udayasekhara Rao, P., 1979. Leucine and isoleucine content of jowar and its pellagragenicity. Indian Journal of Experimental Biology. Vol. 17, pp: 659-661. Borresen, T., 1992. Quality of wild and reared fish. In: Huss, H.H., Jacobsen M., Liston, J. (Eds.). Quality assurance in the food industry. Elsevier, Amsterdam. pp: 1-17. British Pharmacopoeia (BP). 2011. Official methods of analysis, (100th). Brooks, S.; Tyler, C.R. and Sumpter, J.P., 1997. Egg quality in fish: what makes a good egg? Reviews in Fish Biology and Fisheries. Vol. 7, pp: 387-416. Carpene, E.; Martin, B. and Libera, L.D., 1998. Biochemical differences in lateral muscle of wild and farmed gilthead sea bream (Sparus aurata L.). Fish Physiol. Biochem. Vol. 19, pp: 229-238. Charlton, M., 2006. Branched-chain amino acid enriched supplements as therapy for liver disease. Journal of Nutrition. Vol. 136, No. 1, pp: 295S-298S. Chen, C.; Sander, J.E. and Dale, N.M., 2003. The effect of dietary lysine deficiency on the immune response to Newcastle disease vaccination in chickens. Avian Diseases. Vol. 47, No. 4, pp: 1346-1351. Chyung, J.H. and Griminger, P., 1984. Improvement of nitrogen retention by arginine and glycine supplementation and its relation to collagen synthesis in traumatized mature and ageing rats. Journal of Nutrition. Vol. 114, pp: 1705-1715. FAO/WHO. 1985. Energy and protein requirements. Technical Report. WHO, Geneva, Switzerland. No. 72. FAO/WHO. 1990. Energy and protein requirements. Report of joint FAO/ WHO/UNU Expert Consultation Technical Report. FAO/WHO and United Nations University, Geneva, Series No. 724, pp: 116-29. Grigorakis, K; Alexis, M.N. ; Taylor, K.D.A. and Hole, M., 2002. Comparison of wild and cultured gilthead sea bream (Sparus aurata); composition, appearance and seasonal variations. International Journal of Food Science & Technology. Vol. 37, pp: 477-484. Hyland, K., 2007. Inherited disorders affecting dopamine and serotonin: critical neurotransmitters derived from aromatic amino acids, Journal of Nutrition. Vol. 137, No. 6, pp: 1568S-1572S. Jacobsen, J.G. and Smith, L.H., 1968. Biochemistery and physiology of taurine and taurine derivatives. Physiological Reviews. Vol. 48, No. 2, pp: 424-511. James, C.S., 1995. Analytical Chemistry of Foods. Blackie academic and professional press, London. pp: 90-92. Kim, J.D. and Lall, S.P., 2000. Amino acid of composition whole body tissue of Atlantic halibut (Hippoglossus hippoglossus), yellowtail flounder (Pleuronectes ferruginea) and Japanese flounder (Paralichthys olivaceus). Aquaculture. Vol. 187, pp: 367-373. Kmínková, M.; Winterom, R. and Kučera, J., 2001. Fatty acids in lipids of carp (Cyprinus carpio) tissues. Czech Journal of Food Sciences.Vol. 19, pp: 177-181. Lee, H.Y.M. and Cho, K.C., 2008. Effects of dietary carbohydrate: lipid ratio on growth and body composition of juvenile Giant Croaker (Nibea japonica Temminck & Schlegel). World Aquaculture, Meeting Abstracts. 327 p.
Li, P.; Mai, K.; Trushenski, J. and Wu, G., 2008. New developments in fish amino acid nutrition: towards functional and environmentally oriented aqua feeds. Amino Acids. DOI 10.1007/s00726-008-0171-1. Liao, S.M. ; Du, Q.S. ; Meng, J.Z. ; Pang, Z.W. and Huang, R.B., 2013. Themultiple roles of histidine in protein interactions, Chemistry Central Journal. Vol. 7, pp: 44. Mendoza, C., 2002. Effect of genetically modified low phytic acid plants on mineral Absorption. International Journal of Nutrition and Food Sciences. Vol. 37, pp: 759-767. Mischoulon, D. and Fava, M., 2002. Role of S-adenosyl-L methionine in the treatment of depression: a review of the evidence. American Journal of Clinical Nutrition. Vol. 76, No. 5, pp:1158S-61S. Mohanty, B.; Mohanty, A.; Ganguly, S.; Sankar, T.V. ; Chakraborty, K.; Rangasamy, A.; Paul, B.; Sarma, D.; Mathew, S.; Kunnath Asha, K.; Behera, B.; Aftabuddin, M.D. ; Debnath, D.; Vijayagopal, P.; Sridhar, N.; Akhtar, M.S. ; Sahi, N.; Mitra, T.; Banerjee, S.; Paria, P.; Das, D.; Das, P., Vijayan, K.K. ; Laxmanan, P.T. and Sharma, A.P., 2014. Amino Acid Compositions of 27 Food Fishes and Their Importance in Clinical Nutrition. J. Amino Acids. Vol. 2014, pp: 1-7. NRC. 1993. National Research Council. National Academy of Sciences, Nutrient Requirements of Fish.Washington, USA. 124 p.
Oladapa, A.; Akın, M.A.S. and Olusegun, L.O., 1984. Quality changes of Nigerian traditionally processed freshwater fish species. II. Chemical composition. Journal of Food Technology. Vol. 19, pp: 341-348. Pellett, P.L., 1996. World essential amino acid supply with special attention to South-East Asia. The United Nations University. Food and Nutrition Bulletin. Vol. 17, No. 3, pp: 204-234. Ruiz-Capillas, C. and Moral, A., 2001. Changes in free amino acids during chilled storage of hake (Merluccius merluccius) in controlled atmospheres and their use as a quality control index. journal European Food Research and Technology. Vol. 212, No. 3, pp: 302-307. Sandstrom, B.; Almgren, A.; Kivisto, B. and Cederblad, A., 1989. Effect of protein and protein source on zinc absorption in humans. Journal of Nutrition. pp: 48-53. Sarma, D.; Akhtar, M.S. and Das, P., 2013. Nutritional quality in terms of amino acid and fatty acid of five coldwater fish species: implications to human health. National Academy Science Letters. Vol. 36, No. 4. pp: 385-391. Satterlee, L.D. ; Marshal, H.F. and Tennyson, J.M., 1979. Measuring proteins quality. Journal of the American Oil Chemists' Society. Vol. 56, pp: 103-109. Segura, R. and Ventura, J.L., 1988. Effect of L-tryptophan supplementation on exercise performance. International Journal of Sports Medicine journal. Vol. 9, No. 5, pp: 301-305. Tzikas, Z.; Amvrosiadis, I.; Soultos. N. and Georga kis, S., 2007. Seasonal Variation in the Chemical Compositi on and Microbiological Condition of Mediterranean Horse Mackarel (Trachurus mediterraneus) Muscle from the North Aegean Sea (Greece). Food Control. Vol. 18, pp: 251-257. Wang, W.; Wu, Z.; Dai, Z.; Yang, Y.; Wang, J. and Wu, G., 2013. Glycine metabolism in animals and humans: implications for nutrition and health. Amino Acids. Vol. 45, No. 3, pp: 463-477. Williams, M., 2005. Dietary supplements and sports performance. Journal of the International Society of Sports Nutrition. Vol. 2, No. 2, pp: 63-67. Wilson, R.P. and Cowey, C.B., 1985. Amino acide composition of whole body tissue of rainbow trout and Atlantic salmon. Aquaculture. Vol. 48, pp: 373-376. Wu, G., 2013. Functional amino acids in nutrition and health. Amino Acids. Vol. 45, No. 3, pp: 407-411.